Screen shot of the game Zerline from Pretty Good Solitaire. 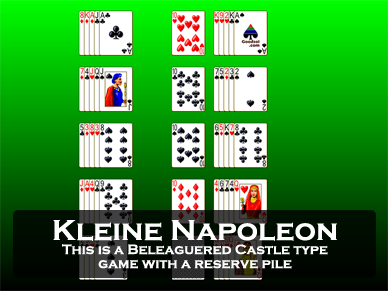 Zerline is a two deck Castle type game. 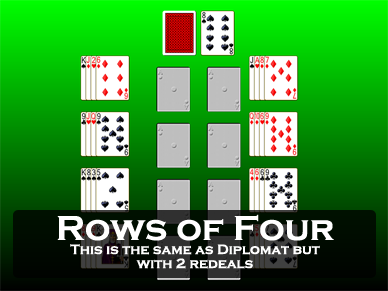 At the start of the game 5 cards each are dealt face up to 8 tableau piles. The remaining cards form a stock, which is turned over one card at a time to a waste pile. There are eight foundation piles, which begin with Kings and are then built up in suit from the King to an Ace up to Queens. The object of the game is to move all of the cards to the foundation piles. Finally, there is also a reserve pile. This reserve pile can contain up to four cards. Only the top card is available for play on the foundations or tableau. Cards cannot be played from the waste pile to the reserve - only cards from the tableau can be moved to the reserve. In the tableau, building is down regardless of suit. Only one card may be moved at a time. Spaces can be filled only by Queens. Play consists of building sequences in the tableau and turning over cards from the stock to the waste. You can use the reserve pile as storage to bring buried cards into play. It is best to avoid putting too many cards in the reserve that you cannot immediately move out of it, because if you fill up the reserve you may get blocked. Try to build long sequences in the tableau. A space is only useful if you have a Queen available to put in it. Cards can be moved back from the foundation piles to the tableau - this can be useful to get lower cards onto the tableau. Zerline is an easier version of Beleaguered Castle. 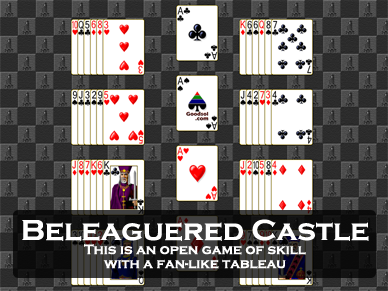 Unlike Beleaguered Castle, it is likely that nearly every game is winnable. 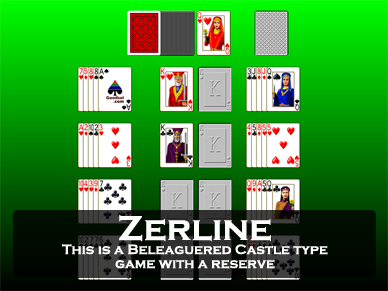 Zerline is one of the 850 games in Pretty Good Solitaire.